Masks are an important detail and aspect when it comes to differ between good and real good slasher movies in my opinion. I always enjoyed a movie even more when the killer had an awesome mask to wear. These sometimes are just some ordinary carnival or even hockey masks like Jason had one to a mask made of body parts like Leatherface. The reason why most of the killers wear masks has to be the fact the killers seem more invulnerably and unknown and it's a psychology thing as well to kind of traumatize the victims and the surround. Curtains is a kinda uknown example of how a slasher film should be done, released in 1983 in Canada. The kills there aren't really remarkable if you take it from a matter-of-fact point of view but there's that one scene on the ice where everything seems so calm and peaceful and then the killer is suddenly skating towards the victim with a kind of meathook. That's just a really creepy scene that let's you shudder when you see it the first time. And it's definitely the highlight and most remarkable scene from the film as well. Check it out if you haven't already! This slasher movie was shot in Canada as well, but came out two years earlier in 1981. It takes place in a small village in the mountains near a mine where twenty years ago a tragic accident killed several miners on Valentines Day. All these years the village refused to celebrate on Valentines Day. On the first Valentines Day party since the accident a killer masked with a miner mask kills the people on this party. This is really a cool and different idea for a slasher movie and the mask also seems very creepy. 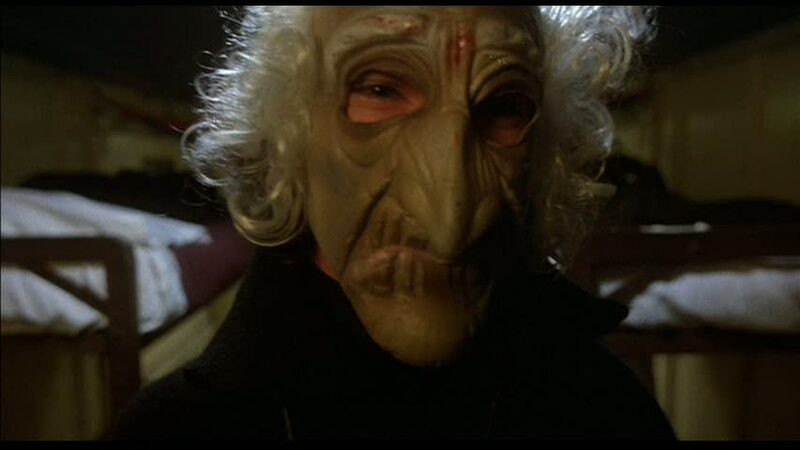 This movie is one of my favourites of the early era, not least because of the awesome mask. One of the most well known slasher of the 80s has to be Terror Train, starring scream queen Jamie Lee Curtis and famous illusionist David Copperfield. The plot here is a costume party on an overnight train, one person invites himself to the party and stabbing the kids down one by one. I can imagine the mask shown in this picture was the cause of many sleepless nights of the kids watching Terror Train. It is indeed a really creepy carneval mask of an old man. It really adds to the corny and dark atmosphere of the film itself. Maybe my favourite movie with Jamie Lee Curtis after Halloween. A very creepy and effective mask is used in the 1981 slasher Nightmare. This one got relatively famous for its notation in the Video Nasties list. Another funny story behind this one is that Tom Savini is said to have made the SFX for this movie, later it was appealed that he didn't made a thing but just gave some instructions on the telephone. It's like the example above a mask of an old man, this one has more like a green skin. The insane gore effects and also this mask makes Nightmare to one of the more controversial movies of the 80s and definitely one of the better ones as well. Jason Voorhoes, the classic killer in slasher history has one of the most awesome masks as well. Basically it's just some kind of hockey or lumberjack mask but it became world fame. It's not the first mask appearing in slasher films ever as Jason didn't appear until the second part of Friday the 13th in 1982, but I believe it had a great impact on the progression of masks and slasher films in general. Also thanks to Friday the 13th an avalance of backwood slashers were released in the early to mid 80s. April Fools Day wasn't a topic in slasher movies until 1986 eventually two films about that theme were released, one of these two films is this one called Slaughter High. Marty Rantzen is your typical highschool nerd and is radically pranked by his schoolmates at April Fools Day. The joke then somehow gets out of hand and Marty gets his face burned. Some years later Marty arranges a class reunion to take revenge. In the final few death scenes he wears this awesome clown mask. For the mask alone this is my favourite movie of 1986 and Marty has to be one of the coolest revenge killers in slasher history. Don't miss this one! This movie from 1976 somehow got it's praise for being one of the very first movies after Texas Chainsaw Massacre with considerable gore footage. It stars Brooke Shields in her first role ever and was released three times in 1976, 1978 and 1981 as Communion, then Alice Sweet Alice and Holy Terror. The killer in here deserved it's notation in the Top 10 as wearing a yellow raincoat and a glossy grinning mask. It makes you tremble when you watch Communion for the first time and keeps its effect to the watcher. The Seventies was a hell of a sickfuck decade! This one is considered a proto-slasher as well as it was released the same year as Alice Sweet Alice in 1976. Not many know this one, I think it's one of the darkest and most evil movies ever. No cheesy one-liner, no bad acting, no comedy at all, just plain dark and creepy. Another fact that makes this little movie even creepier is that this film is claimed a true story. The mask here is one of the simplest but most effective. Director Charles B. Pierce did a immense number of films but he's best known for The Town That Dreaded Sundown and The Legend From Boggy Creek from 1973. The Prowler from 1981 well deserves his second place. SFX are made here by maestro Tom Savini and is his best work in my opinion (maybe equal to The Burning). The killer is dressed as a WWII-veteran who takes revenge for a fallen soldier. His weapon of choice is a pitchfork which does its work by killing one by one at prom night. 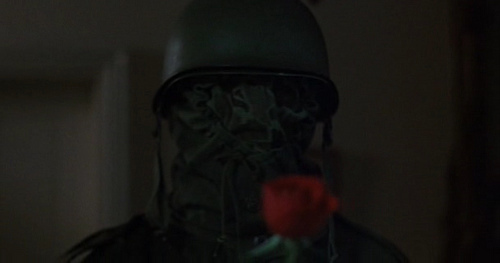 This crazy costume and the killer itself freaked me out when I first watched The Prowler and I still can't help but cringe during some of the scenes. Definitely check out if you can handle the great gore in this one and want some serious plot as well! As I saw Tourist Trap for the first time, I stayed up very long because I couldn't sleep. 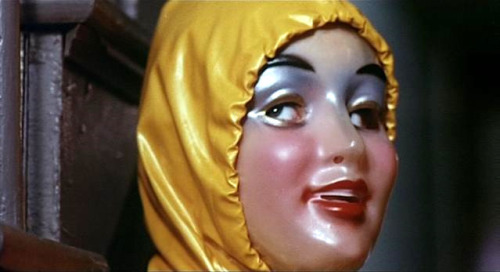 This movie has not one but a whole arsenal of masks, mannequins and puppets. It does not work with gore but sheer terror and you'll feel real fear. Not many movies can have that effect on me but this one really does. 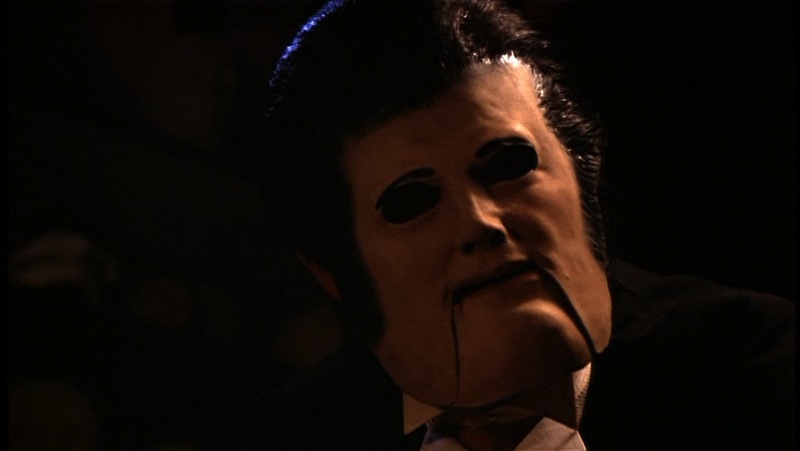 Robert A. Burns, who worked on Texas Chainsaw Massacre did most of the SFX, including all the puppets and mannequins. I won't reveal everything as I really want you to watch this one for yourself. It's one of my very favourite movies of all time, now go and check it out!